Long before the Liverpool sound even existed, it was Bert Kaempfert who, with My Bonnie, made the Beatles into recording stars – as early as 1960 preparing the ground for Paul McCartney, John Lennon & Co’s phenomenal international career: they partook of his knowledge, his skills and that creativity which he so undogmatically imparted. 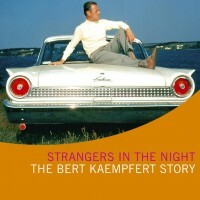 The list of the solo artists who scored success after international success with Kaempfert’s distinctive compositions reads like a Who’s Who of light music: Frank Sinatra, Al Martino and Dean Martin. Ella Fitzgerald and Shirley Bassey. Sarah Vaughan and Peggy Lee. Nat “King” Cole, Herb Alpert and Johnny Mathis. Brenda Lee, Caterina Valente, Andy Williams and Nancy Wilson – to name but a few. Quite simply, they all felt at ease with the melodies this Hamburg composer and arranger created, melodies as light and unforced as their construction was inspired. Whether intentionally or not, he clearly knew how to reproduce in his music the nature of the person he was: pleasant, unassuming and restrained – yet at the same time infectious, expressive and brimming with joie de vivre. In short, melodies that do you good. In Marc Boettcher’s documentary we hear from Bert Kaempfert’s friends and companions, Freddy Quinn, Hildegard Knef and James Last, among others, as well as from members of the Kaempfert family.